Recently I was on Pinterest looking at classroom supplies when I came across the strangest looking pencil sharpener. Fascinated by its looks and curious as to why it looked that way I clicked on the link for Classroom Friendly Supplies. I watched a video that showed how to use the pencil sharpener. That video explained why the pencil sharpener looked so strange. The front pulls out. There are two knobs on the top. When you squeeze the knobs together you open the first hole where you stick the pencil through. The pencil then goes into the hole in the sharpener. The first hole has tiny teeth that hold the pencil in place. Why is this important? Simply because that leaves the pencil holding hand free. You can place your free hand on top of the pencil sharpener or you can use the small bar that allows you to attach it to the edge of any surface. The magic happens when you sharpen the pencil. One thing I've always hated about electric pencil sharpeners is that students often stand there shoving the pencil in, removing it, looking at it, then repeating that step over and over again. With this pencil sharpener you begin to sharpen the pencil and watch the part you had pulled out in the front, slowly move in as the pencil sharpened. You can't over-sharpen the pencil. That is where the magic comes in. The hand crank will begin to turn super easy when the pencil is sharpened enough. My husband hates when I sit down to write because I interrupt him, (his desk is opposite mine), by constantly sharpening my pencils with our electric sharpener. I can't write if the pencils are not real sharp. I prefer writing with pencils over pens. I just love the feel of the graphite grabbing the paper. I feel I have more control. So, it wasn't enough for me to use this wonderful tool. I needed to test it out with some kids. My grandson Jacob and granddaughter Haylee spent the night with us and I had Haylee try it out. She's going into fourth grade and has her own desk in her room. I was thinking this would be an awesome gift for her. She cranked away and then got her pencils out of her writing portfolio she keeps at my house and sharpened every single one. Jacob wanted to try it. He is almost 5. So, I demonstrated it for him and then told him what to do step by step. He sharpened the rest of my pencils. It was easy and he thought it was fun. My son came the next weekend and I showed it to him. As a former draftsman he knows the importance of sharp pencils. He had so much fun, he called his wife in to see this wonder. He kept breaking pencil leads so he could sharpen them. Then he broke two more and had his wife sharpen them. You know it is a cool item when your grown children tell you they want them for their children for Christmas. I plan on spending quite a bit of money buying several of them this year. 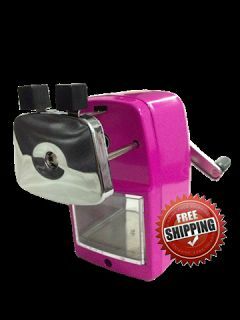 I will definitely need one in my house to replace the electric pencil sharpener I will place in my husbands work shed. I think they will make great gifts to the 3 new teachers in my department this year. You have got to go to www.classroomfriendlysupplies.com and check them out. Read through her site. This pencil sharpener was created by a teacher. Watch the videos she has. Part of every sale goes to several different charities. Please check out that page as well. I guarantee you that you won't find a better pencil sharpener for your classroom or office.